We have heard that Samar has been released on bail a few hours ago. We are awaiting further info about why/ if she was taken straight to prison following her arrest. It is obvious that her international reputation and public visibility will have worked in her favour – perhaps after some reflection by the Saudi authorities. Her arrest led to stories making it across the world through the media and social media. Thanks are due to everyone who helped achieve this – by their tweeting and other social media activity as well as those journalists who got stories out. From what we understand the charges against her relate to her alleged use of social media and a photograph that made it onto Twitter of imprisoned lawyer Waleed AbulKhair. A petition was started calling for her release and the dropping of charges we hope as many people will sign as possible until the charges are dropped. The petition can be opened from this link. No democrat, no free speech or human rights activist is safe in Saudi Arabia. Our campaign has to continue not only for Samar but all other victims of Saudi Arabia’s refusal to recognise human rights. This entry was posted in Uncategorized on January 13, 2016 by Pete Radcliff. We have just heard that Samar Badawi, the sister of free speech activist Raif Badawi has just been imprisoned in Saudi Arabia. Samar has heroically continued to campaign for the release of her brother and her husband the lawyer Waleed Abu Alkhair. Waleed represented Raif in his trial and is also a free speech campaigner. 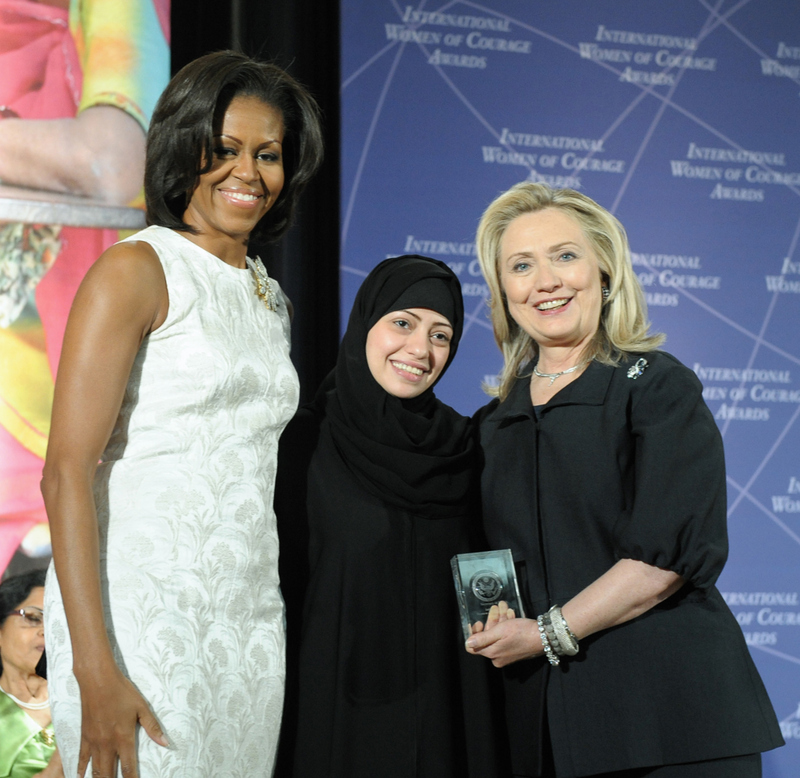 Samar’s contribution to women’s rights and human rights has been recognised internationally. She has continued to be an important source of information for those wanting to know what is going on there. We understand that she has been imprisoned for her activity on Twitter. This latest development is very disturbing. It is an indication that the repression continues to grow in Saudi Arabia. It is also an indication that the British government has been totally ineffective in pursuing human rights reform in Saudi Arabia. Its claims that it has a useful relationship with the Saudi tyrants is nonsense. This entry was posted in Uncategorized on January 12, 2016 by Pete Radcliff. English PEN along with other campaigns in the We are Raif coalition make the call to free poet Ashraf Fayadh, sentenced to death in Saudi Arabia for apostasy. Last week, Ashraf Fayadh, a poet, artist, curator, and member of British-Saudi art organisation Edge of Arabia, was sentenced to death in Saudi Arabia for apostasy. Fayadh was first detained in August 2013 in relation to his collection of poemsInstructions Within. He was released on bail but rearrested in January 2014. Months later, in May 2014, the General Court of Abha found proof that Fayadh had committed apostasy but had repented for it. The charge was dropped, but he was nevertheless sentenced to four years in prison and 800 lashes in relation to numerous charges related to blasphemy. Eighteen months later a judge has declared that repentance was not sufficient grounds for the apostasy charge to be dropped, and reversed the previous ruling. Last week, Fayadh was sentenced to death. In the days since, rights groups and international organisations have strongly condemned the sentence, while poets and writers, including Ruth Padel, Simon Schama, and George Szirtes are among the individuals who have spoken out on Fayadh’s behalf. This entry was posted in Uncategorized on November 25, 2015 by Pete Radcliff. “A Sri Lankan female domestic worker has been ordered to be stoned to death by a Saudi court for adultery. The married woman from Maradana has had an affair with a Sri Lankn youth employed in Saudi Arabia, and made a confession before the court, foreign media reports say. The man was given 100 lashes. This entry was posted in Uncategorized on November 24, 2015 by freeraefuk. PEN is appalled at the news that Ashraf Fayadh, a poet, artist, curator, and member of British-Saudi art organisation Edge of Arabia, has been sentenced to death. According to reports, Fayadh, originally sentenced to four years in prison and 800 lashes in May 2014, is now due to be executed following a retrial. We are shocked by the news that a Saudi court has ordered the execution of poet Ashraf Fayadh. This is yet another example of the Kingdom’s complete lack of respect for freedom of expression and its persecution of free thinkers. We call on the Saudi authorities to release him immediately and unconditionally, and urge our own government to speak out on his behalf as a matter of urgency. The decision to sentence Ashraf Fayadh to death is outrageous not only because it is vastly disproportionate to anything he may have done, not only because the death penalty is wrong in every instance, and not only because he has said in mitigation that he has done nothing that deserves death, but also because it is not a crime to hold an idea, however unpopular, nor is it a crime to express opinion peacefully. 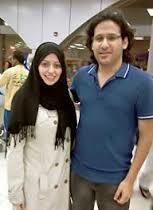 Saudi Arabia must unconditionally release Fayadh, as well as Raif Badawi and Waleed Abulkhair. We are outraged that Fayadh’s retrial—which should have led to the absurd charges against him being dropped entirely—has instead resulted in a death sentence. We call on the Saudi authorities to cease handing down such draconian sentences for the supposed “crime” of free expression, and to release those already convicted on similar grounds. PEN urges the Saudi authorities to desist from punishing individuals for the peaceful exercise of their right to freedom of expression. Other cases of particular concern to PEN include the liberal blogger Raif Badawi, winner of the 2015 PEN Pinter Prize for an International Writer of Courage, and his lawyer and brother-in-law Waleed Abulkhair. Badawi has been sentenced to ten years in prison and 1000 lashes, while Abulkhair is serving a 15-year prison sentence. English PEN continues to hold regular vigils for Badawi and Abulkhair outside the Saudi Embassy in London; we are also asking members of the public to pledge to protest in the event that Badawi is flogged again. We are also calling on the British government to put pressure on the Saudi authorities to release Fayadh, Badawi, Abulkhair and others detained in violation of their right to freedom of expression. Just last month, David Cameron claimed he ‘completely disagreed with [the Saudi authorities] about their punishment routines, about the death penalty, about all those issues’. We therefore urge the Prime Minister and the Foreign Secretary Philip Hammond to raise Fayadh’s case at the earliest opportunity with the Saudi authorities and to call for his immediate release, as they successfully did in the case of Brit Karl Andree last month. This entry was posted in Uncategorized on November 21, 2015 by Pete Radcliff. We are writing to you on behalf of We Are Raif: a campaign for free speech and human rights in Saudi Arabia. We are extremely concerned by the statement issued by the Raif Badawi Foundation on behalf of Mr Badawi’s wife Ensaf Haidar yesterday, 27 October. According to the statement, Ms Haidar received information from an ‘informed source’ that the Saudi Arabian authorities plan to resume flogging her husband. This information appears to have come from the same source that correctly informed her of the first flogging in January 2015. As you are aware, Raif Badawi is currently serving a ten-year prison sentence in Saudi Arabia in violation of his right to freedom of expression. Mr Badawi was also sentenced to 1000 lashes: the first 50 of these were administered on 9 January 2015. According to our information, he was due to receive 50 lashes each week for a further 19 weeks. Ms Haidar understands that her husband’s case is under review by the Supreme Court. If the Foreign Office has any further information on the progress of Raif Badawi’s case, we would strongly urge you to share this with his wife and children, and with the general public. Of further concern is the news that the Supreme Court has confirmed the death sentence against Sheikh Nimr al-Nimr. Sheik Nimr al-Nimr’s nephew Ali al-Nimr is also among those sentenced to death for his involvement in anti-government protests. An urgent protest calling for the release of both men and others facing the death sentence was held outside the Embassy of Saudi Arabia London today, Wednesday 28 October. Earlier this month, we warmly welcomed the news that the government had cancelled their bid to sell prison training services to the Saudi government. We hope that the government will take an equally strong position on the concerns outlined in this letter, and use your influence to urge Saudi Arabia to put an end to human rights abuses domestically and to its complicity with human rights abuses in the region. This entry was posted in Uncategorized on October 28, 2015 by Pete Radcliff. This entry was posted in Uncategorized on October 15, 2015 by Pete Radcliff.